Here's my latest WorldNetDaily column entitled Tebowing for Life. If it takes Revelations like this to get our country back from the destruction of the leftists and the liberals, then let it begin HERE and NOW. Tebow time at our house tonight!!! Another unashamed Christian quarterback is Aaron Rodgers of the Green Bay Packers. Rumor is that while at an event raising money for research for a specific disease, Rodgers met a young girl who was dying from the disease. She spoke of her faith and of how she would soon meet Jesus in heaven. Rodgers asked her to save a place for him. They are out there, but few as open as these two. @Terry in Florida - Hahahahaaaa! Boise State's blue field drives me nuts! I do like football, but I'm certainly not rabid. My prayers are with Tebow, though. I'm sure that after his team's trouncing last night, there are plenty who are celebrating. "Tebow lost! That proves there is no God! Yay!" I read a very good article by an atheist who was exploring the reasons why he wanted Tebow to fail. As he thought about it, he realized that, as an atheist, his wanting Tebow to fail didn't make sense. After all, if there is no God, then the outcome of football games does not matter, Tebow doesn't matter, nothing matters. He realized that wanting Tebow to lose was actually an assent that things did matter, and, therefore, a confession that there might be a God. Pretty funny to see him wrestle with that. 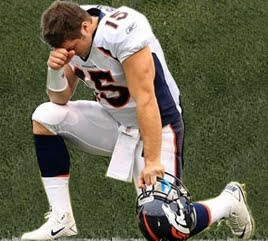 My prayers are with Tebow because any slip on his part will be trumpeted and celebrated. He is a high-profile genuine Christian, and I would love to see him stay high-profile, a shining light contradicting the darkness. The only real way for him to stay high-profile is to win a lot, so I have become a default Broncos fan. If he doesn't stay high-profile, I know he will still be a good, respectable, genuine, humble, Christian man... which is what they hate about him.